In the midst of the most turbulent American political season in decades, I recently re-read Shakespeare’s play Julius Caesar. His source was mostly the historian Plutarch. The play is still relevant, and still illuminating on the subjects of loyalty to others versus loyalty to country, honest differences of political opinion, and whether and when violence is justified. This day, the 15th of March in the year 44 B.C., did not work out so well for Julius Caesar. 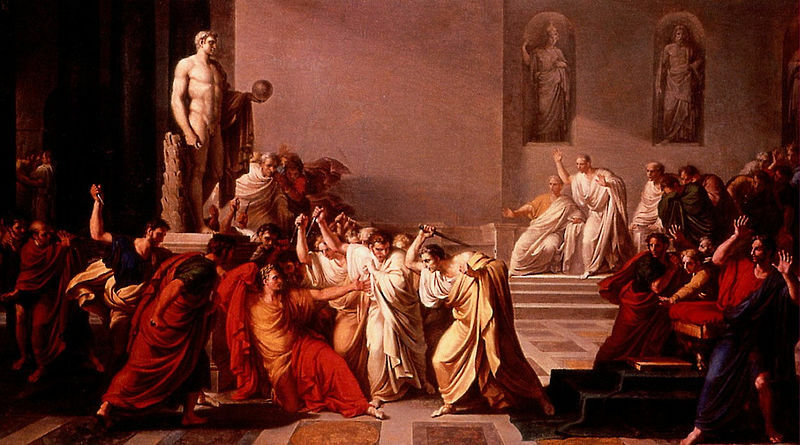 According to the historian Plutarch, a fortune-teller warned him that something terrible would happen to him before the “Ides of March.” Confident fellow that Julius Caesar was, he laughed at the prediction and even gloated, as he made his way to the Roman Senate on that morning. He figured he was home free. But assassins awaited him at the Theater of Pompey, where Senate sessions were being held temporarily. Events excalated. Caesar refused to resign when the Senate politely requested that he step down, and with one of his legions he defiantly crossed the Rubicon River into Italy. That was strictly forbidden. Military conquest was for the frontiers. Rome was for reasoned debate among civilized men. Ever since Julius Caesar’s audacious and risky march across that border river, the expression “crossing the Rubicon” has meant a fateful and irreversible action. There was no turning back, for Caesar or for Rome. Looking back over the centuries, it appears that the common people loved Julius Caesar for his flamboyance and for the military glory he had brought home to Rome. But his aristocratic peers saw only danger ahead. They decided that Caesar had to go. Once he was safely dead and out of the way, his heir, Octavius, obligingly made Julius Caesar a god. 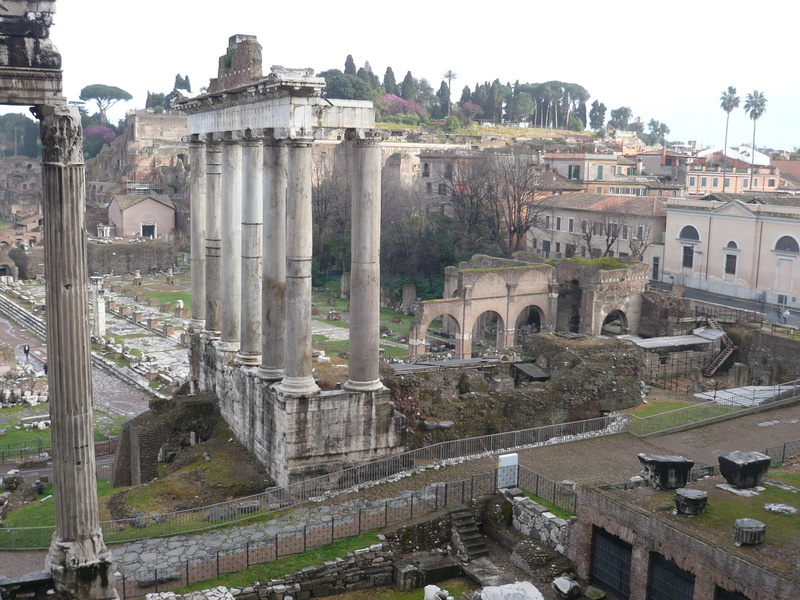 Today, the Roman Forum is a haunting place to wander, pondering the ups and downs of history. I bought a book with clear overlays which shows how the various buildings must once have looked. But even without a visual aid, it is not hard to imagine Julius Caesar and his entourage making his way through the Forum on his way to the Senate session on that fateful day in 44 B.C. This entry was posted in Italian History, Italy, Rome, Rome Museums, Why I Love Italy and tagged " Vincenzo Camuccini, "Death of Caesar, Crossing the Rubicon, Ides of March, Julius Caesar, Octavius, Roman Forum on March 15, 2014 by Claudia Suzan Carley.